Along with the new metrics, we’re also introducing two new data dimensions &mdash; Carrier and App Version. You can use them to track your app’s installation trends across mobile operators or monitor the launch metrics of specific app updates. Check out the new Application Statistics next time you visit the Android Market Developer Console. 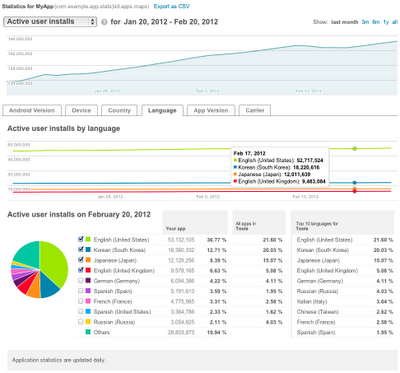 We hope they’ll give you new insight into your app’s user base and installation performance. Watch for related announcements soon &mdash; we are continuing to work on bringing you the reporting features you need to manage your products successfully on Android Market.